Mike Williams has written what I consider to be the best Google Maps API Tutorial. It's very simple and to the point. I'm sure with a few months of time I'd be an expert on the Google Maps API per Google's documentation, if I quite my job and did nothing but work with that API. But luckily Mike's tutorial makes the Google Maps API accessible in about 30 minutes. sqrt(8.9^2 + 6.5^2) = 11.0"
Of course, the screen size won't take up the full diagonal. So let's leave 1" diagonal for the margins, then the ASUS Eee PC could have a screen size of 11" minus 1" minus 1", or 9". In short, a diagonal of 8.9" is theoretically possible. Japan and India agreed Friday to launch a bilateral currency swap arrangement in the spring that allows the two to provide up to $6 billion to stem financial crises, Japanese officials said. Currency swaps typically benefit both parties, with each "winning" what is important to them. Haven't delved into them since my MBA program. Per Rasmussen, McCain is now the Republican front-runner nationally. The price represents the likelihood to win a given state. 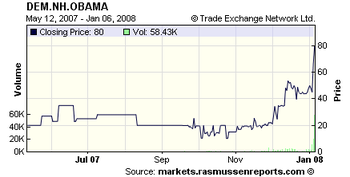 Obama gained support after winning Iowa. 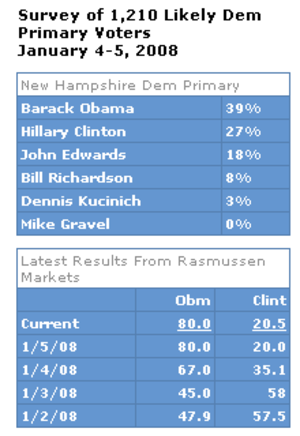 Also, the trends are supported by a Rasmussen weekend poll in New Hampshire that shows the following results. Second table below shows the data from above. Per Saptarshi Purkayastha, the ASUS Eee PC will launch in Mumbia, India, sometime in the next few weeks. Trying to make sense of the MyBlogLog profile. It won't let me upload a picture. C'mon Yahoo! But Intel loves Asustek because Intel powers the ASUS Eee PC. The folks (or autobot) at Google Reader really did a good job this time around. Out of 20 recommendations, I subscribed to 13. That's 65%. On my personal laptop, I'd like to get a better handle on where I store my files. Unlike being at work, I don't store files on my laptop each day. Thus, the folders I create on occasion sometimes get lost and I don't always do things consistently. Thus, I'm wondering if my best bet is to just store on Google Docs or to just dump everything into My Documents. Can't wait for GDrive to come along! My prediction for the Democrats is Obama over Clinton by 1 point with Edwards 7 points behind Obama. Expect some outages as servers get flooded. Also, this is the first time such polls will go online so quickly. For other sources, you may want to try Iowa newspaper and TV stations (try a search like "des moines newspaper"). After downloading the PDF reader Foxit Reader from Download.com, I got a nice reminder email to stop back and provide my rating. I image most people Download.com visitors aren't registered, so most don't rate the products. In fact, out of 636,221 downloads of Foxit Reader, only 31 people have left a rating. That means that just 1 person out of every 20,523 downloads left a rating, or 0.0005%. You can see the user feedback here. That's not a lot, but it's better than nothing. And Download.com is still the best site to go for software downloads. In any case, here is a case for a new experimental metric, the User Participation Score (UPS). For Download.com, we could give it a score of 0.0005% based on this once case. The only people who would register at Download.com are those who really, really, really want to share feedback (like me). Download.com needs to give visitors a reason to register. One somewhat diabolical way would be to require all downloaders to register. Makes sense. Download.com is providing a service after all. But then again, they could just insert an offer to register in the download process. The holy grail is social features. It would be great to find people similar to you. At the very least, let me see user profiles and what they downloaded and voted on. Marissa Mayer explains that Google introduced the option to view PDF search results as HTML because Adobe's PDF reader was pretty big and slow. For the most part, I always go to Download.com when I need to grab some new software. I search, then refine my search to show only free programs. They are great because no software on Download.com will have embedded advertising trojans or spyware ("Safe, Trusted and Spyware-free"). Shift-insert into Paint, then cut out the relevant portion, then File >> New, Yes, then another Shift-insert, then Save As as a PNG file. That's a lot of steps. So I went to Download.com and discovered Screen Print & Capture 32 3.5. The editors at Download.com (which is owned by CNET) like it and so do the users. I'm now one of them. It's a real time saver. It's nice that I can define the screen area and have the file auto-saved as PNG. Importantly, I haven't been able to tell a difference in quality between my old method and this new generically-named gem. See below. Differences seem to be based solely on the area I selected. Kongregate is great for gamers. By wrapping user-submitted Flash games with various community features, Kongregate's site serves as a unique way for users to play great web-based games alongside friends. And Kongregate is also great for developers. Kongregate operates with an understanding of how difficult it can be for talented game developers - from the aspiring gamesmith to the independent studio - to get the recognition and compensation that they deserve. That's why Kongregate shares microtransaction and advertising revenue with contributing developers, who retain the full rights to their games.